Swami's showers His immense selfless love on His devotees in numerous ways. Miracles is not something new for Sai devotees. This is one of Swami's technique to mark His OmniPresence. We might have heard or even witnessed many miracles happening in our Sai families worldwide. Here is one such miracle which I was very much fortunate to have witnessed. Though it is beyond words to explain that thrilling experience , I am here trying to sincerely put it in words….. This rare miracle occurred on that fine day of 7th may 2005 in one of a great Sai devotee's house in Kanhangad, a place located at the north tip of Kerala, India. 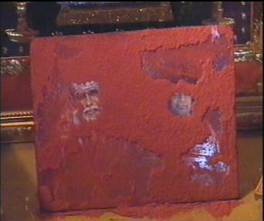 Our beloved Swami's presence is truly experienced in this house for a long time now and this is evident by the Viboothis that Swami is showering in His photos present in this house. For some time now, these viboothis are turned to Kumkum as seen in the photo. 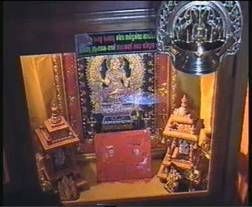 These photos are in fact kept inside a glass shelf in order to avoid any disturbance from the devotees who are thronging in everyday to view the same. On 7th May 2005, when Sri Padma Kumar, a humble devotee and also a dedicated singer from Ernakulam, was presenting kirthans and Bhajans in front of a huge gathering in the same house, the following miracle occurred. 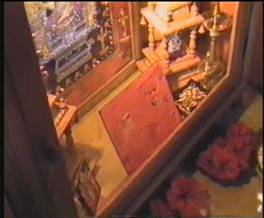 Swami's photo which is already filled with Kumkum, moved some inches away from its original position leaving behind traces of Kumkum (photo 2) along a thin line as an evidence. For those who were fortunate enough to have a glimpse of this wonderful miracle, it was like once in life-time opportunity. During the occasion of Vishu (April 14th 2005) in Puttaparthi, Swami keenly watched Sri Padma Kumar doing magic with his voice. Greatly pleased with his devotion, Swami blessed him with a golden chain with an OM locket. Swami's Leelas are fabulous, just beyond our imagination. Let us dedicate ourself to His Lotus Feet and spread His Mahimas. May Bhagavan grant us strength to do so. May that be our prayer in the coming years.